Why is the Cr-48 going to skip Chrome 19? I would love to have this! From what I remember, Cr-48 does not have the graphical power to run this user interface. Chrome OS developers aim to slim it down enough in the next major update to make it work on Cr-48. But it is looking like support for Cr-48 is going to be dropped in the future as it is simply not capable of keeping up with the updates in Chrome OS. "No, we'll only be skipping the Chrome 19 update for CR-48 users due to platform considerations. To be clear, we’re still committed to supporting CR-48 devices and they will continue to receive security and critical updates as necessary. Samsung Series 5 and Acer AC700 Chromebooks will receive this update and we’ll bring CR-48 devices back onto the release train after this release. Thanks for reaching out and sorry for the inconvenience!" "Security and critical updates..." so - does that basically mean that this is it on the feature train for the CR-48? Sad - I was really looking forward to trying out Aura on it. Me sad. I love my cr-48. Guess it will soon be time to load Linux. Yeah, but Other Linux will still run on it when new ChromeOS won't. yea any linux distro runs on the cr-48 just fine.. It's are shame for Google. Google you are thief! Well, when all else fails, just go back to what you do best; copy other desktop OS UIs..
Well, clearly Google just copied, not stealed. Lol, that looks like a blant copy of MacOS and Windows. On my Acer Aspire One, JoliOS had less problems than ChromeOS, but right now, it runs Linux Mint. And it runs it very well. It's so boring to always see these comments about XYZ copied this from Apple/Microsoft. Aside of Apple/Microsoft doing the exact same thing if there is a better design somewhere else, how do you consider to do a taskbar differently? And even if it had been done differently, then everyone would start to complain because it's not like the stuff you are used to. You just have to take a look at Gnome 3 which tries to create something new and how people responded to it. Exactly. There is almost no innovation in software interfaces now because certain things just work well when done in a certain way. Everyone 'copies' from everyone else. Just get over it. People complain about Gnome 3 because its not in their habits. I personally do like it. 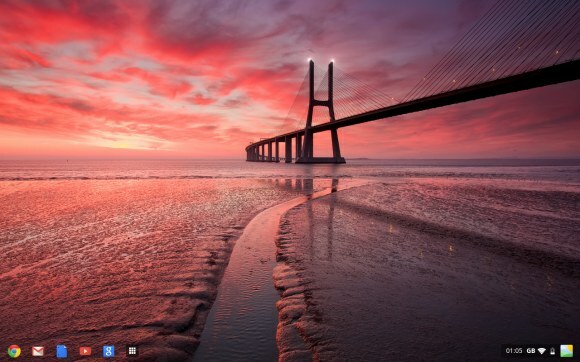 I this design is the best for running multiple applications at once, they must however keep the simple and brilliant design of Chrome OS. Which I think they will, and besides that... They should release it in other countries as well, c'mon now Google, I've been waiting for ages now! Is it possible to install GNU programs as VLC? In Chromium OS with yum I was able to. Have you done an ACL Android Compatibility Layer in order to play Android Games and other Android Apps? My deaktop Sabayon XFCE with Chrome installation from Gentoo repos seems faster and cheaper to me. I hope ARM64 Chromebooks and other "normal" GNU/Linux ARM64 based computers will have more market share. ... and how do you imagine a touch-based Android app working on a non-touch laptop? The same thing they did with google plus,android now with chrome os, they take the familiar and used designs and implement it in their products, to attract more users i guess. I dont know if this is always a smart move, i think Google more than anyone should know that, in the IT world the new idea/concept is what is important, not going back with the old. 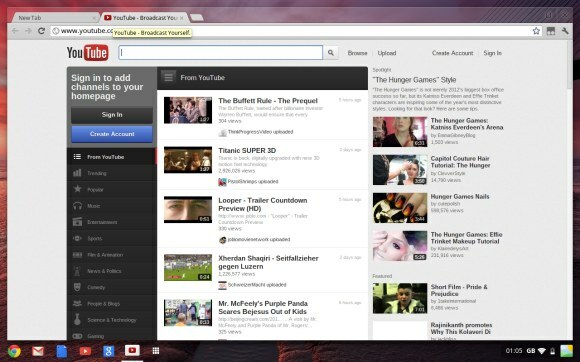 It looks very nice but I think it's still just a browser, except now it looks more like an OS. Now it looks like a cross between iOS and Windows 7. For real? After having so much trouble with Android patent infringement they are doing a GUI that is a blatant copy of Windows 7 and OSX? This is just food for patent attorneys. WOW! I think there's absolutely NOTHING I'm less excited about. I guess "Nothing but the web" didn't really have alot to stand on. Reminds me of Windows...3.1, minus the window border around the icon groups. Managed to ape both Apple and MS while also alienating their reference platform. Brilliant. They basically took windows 7's task bar, and Mac OS X's launchpad, added aero, and shipped it. Is this new Aura GUI based on Wayland? Yes and no. Review the code and you shall see. I have a Samsung Series 5 ... and update ! but I haven't see this new UI ! It is for Dev Channel only at the current time. I haven't look out this version is only for Dev channel. It is so wonderful !!! So good !!! Oh, by the way, what's up with text selection within this form (on my iPad)? It gets broken (as in, I can no longer type or delete characters) once I try to move the insertion point or make a selection! I have to hide the keyboard and tap the field again (or try to hit the desired insertion point without resorting to the loupe-activating tap-and-hold gesture)… Not cool! Microsoft's taskbar, Apple's launchpad, Linux's kernel. 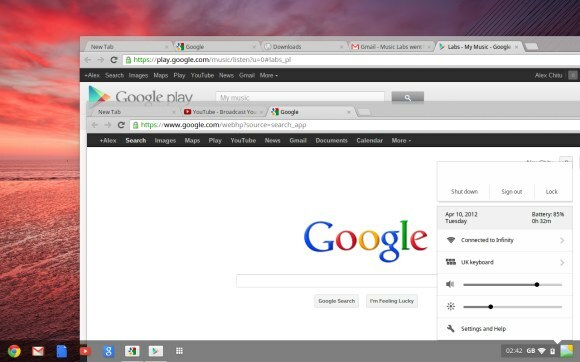 So what's the point of having this 'web' operating system that's slow enough to need a more powerful laptop when you can install Ubuntu, have the same eye candy and run the same Chrome on top of it? It would be nice if Android had a fork or something tailored toward desktops. Or a Googlegineered Linux desktop. 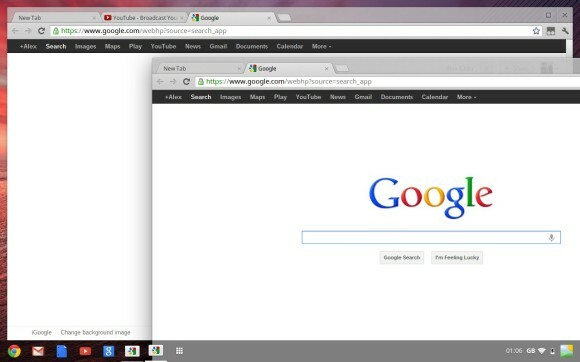 looks like a mix of windows seven with lion, but it rocks!!! This actually makes it a bit more beautiful, fast and still more comfortable and that is actually great. I'm happy that it's still all on the web, that it's still just a browser. 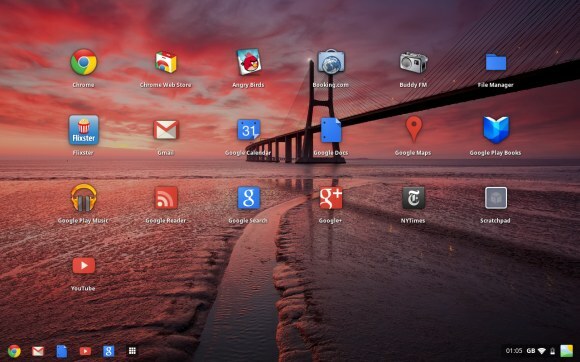 Google's Chrome OS started with a great idea - of booting up your computer right into the web. And I think they should that maintain that cool idea and not stray away from it. It's really an idea that may change worlds! Love the new design BTW. Making things look pretty is really a big leap forward. Wow, this window manager looks so cool, really looking forward to the OS. Man this thing looks like a best-seller! Really awesome theme and pictures!